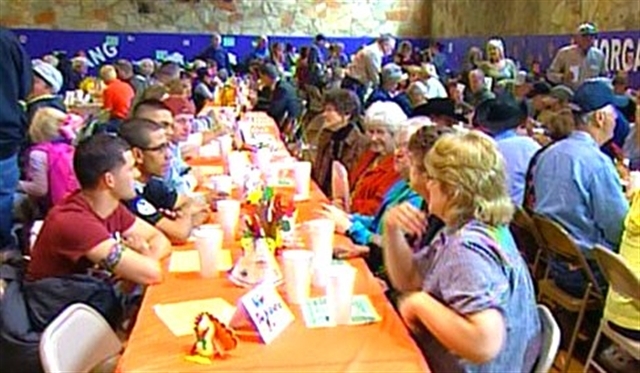 An Erath County tradition that WFFA News in Dallas/Fort Worth termed “a scene that might even be too sweet for Norman Rockwell” continued over the weekend as the good folks of Morgan Mill, Texas hosted their annual Thanksgiving dinner. While a community thanksgiving dinner wouldn’t normally blip the radar of large regional news outlets like WFAA and the Fort Worth Star Telegram, this celebration is special because it has become a tradition not only for the sprawling metropolis of 300, but also for soldiers stationed two hours away at Fort Hood. Morgan Mill UMC is one of many who helps sponsor this event and the majority of the School Board members are also members of the church. To read the entire Star Telegram article, visit www.star-telegram.com. A flash video version of the WFAA News report is also available at wfaa.com.